Wishing all the readers of this blog the best this holiday season. Here’s hoping that the New Year brings you an abundance of blessings – and me a fully edited book! Back in July, I posted about an unusual grey Connemara stallion (Ponies don’t read). There I linked to two unusual grey Iberians, Comico IV and Comico VI. Recently someone sent me a link to the stallion in the video above. He is Favacho Único, a Mangalarga Marchador from Brazil. His resemblance to the two Comico horses is striking. Many wanted to call Comico IV a rabicano. I think the dramatic white tail head (pictured here) was what gave people that impression. In the video of Único, that same trait is very noticeable. It can also be seen in the photo of him on the farm’s website. 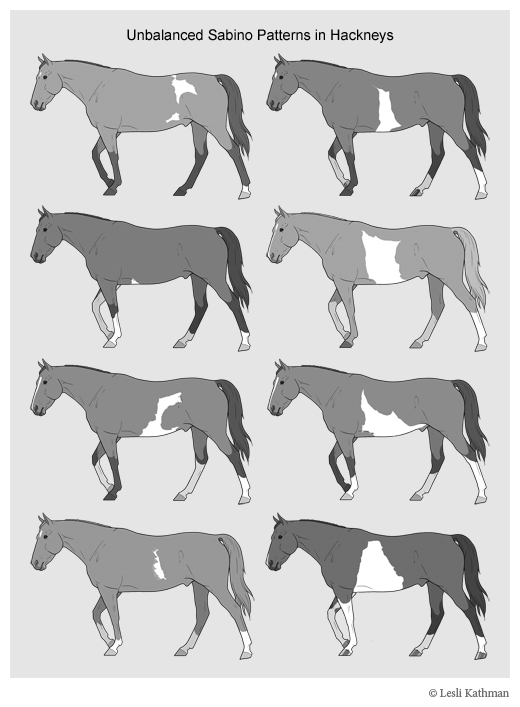 The concentration of the white on the face and legs is also very similar to the Comico horses. He does have a grey parent, and he does have grey offspring, although whether the color came from him or not is not immediately clear. Grey is a common color in that particularly bloodline, so ruling the stallion in or out as the source is difficult. It is clear that whatever is going on with his greying, it was progressive. He is presently 27 years old. Here is a video of him as a younger horse. That is an extreme amount of greying for a horse that, while definitely older, isn’t truly ancient. Still, it is even more unusual for a grey horse to look so dark so late in life. That could have been said for the Comico horses as well. They are certainly oddities! Whatever it is, there are more horses like him among the Herdade horses, the bloodline that produced Único’s sire. This is Herdade Cadillac. Here is the dam of Herdade Cadillac, Herdade Alteza. The sire of Único, Herdade Teatro, is a paternal half-brother to Cadillac. Notice these horses the same concentration of greying on the face and legs. The stallion, Cadillac, even has the same kind of irregular white spots on the body that can be seen on Único. Finding it within a family like that suggests that there is some kind of genetic component. It would be interesting to test the horses (those still living) to see if they are genetically grey. If that is the case, then it would seem that there is some kind of modifier at work that changes the way the greying progresses. In a previous post, I included this Currier & Ives print when talking about how nineteenth century horsemen often associated spotting patterns – pinto or appaloosa – with oriental horses. Their role in circuses, accompanied by handlers with fanciful costumes, probably did a lot to set this idea in the minds of many. It wasn’t just the general public, though. The earliest American stud books often contain references to “spotted Arabian” ancestors. 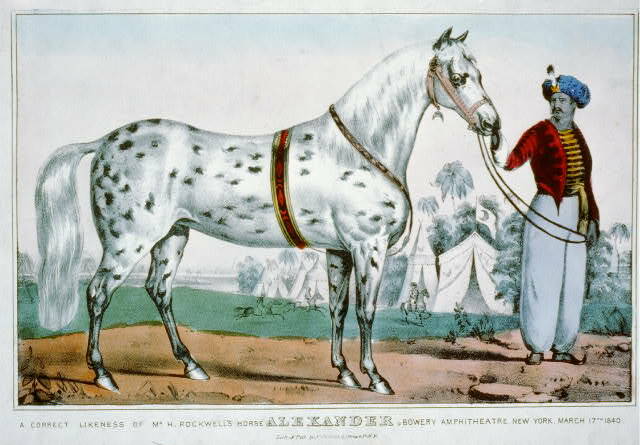 Alexander, the horse pictured in the print, was himself entered into the American Stallion Register. ALEXANDER, spotted, black and white, 15-3/4 hands, 1200 pounds; foaled about 1822. Owned by Page’s circus, who purchased him in the West, and sold him about 1831 for $1000 to a company at Middlebury, Vt. Advertised, 1833, at Middlebury and Vergennes, Vt., by S. H. Baker for the owners. Terms, $7 to $10. In 1836 Harvey Yale of Middlebury bought one half interest in him, and had charge of him two seasons, one of which he was kept at Hancock, Vt., by Mr. Church. Mr. Yale sold him to Mr. Twilight, Vershire, Vt.
Sire of dam of Gray Eagle (Earing’s), and 2d dam of Benedict Morrill. In that entry, he is referred to as a Spanish horse, not an Arabian or other oriental breed as his advertisement might suggest. It may be that the circus later changed his background story, or they may simply have conflated the term Barb with Arabian. Although modern horsemen think of those as being opposites, during the time Alexander was alive the terms were often used interchangeably. But for a time, many American breeders thought horses like Alexander showed their blood-horse origins with their coloring. The colors themselves had largely fallen out of favor at that point, but their presence in the back of the pedigree did not raise eyebrows the way it certainly would today. It is not just the American Stallion Register, either. There are “spotted Arabians” listed in the backs of pedigrees in most of the American light horse stud books from that era. Undoubtedly many were pintos, but the fact that some may have been leopards like Alexander leads to an interesting question. Just how many American light breeds carry hidden patterning genes? The two horses listed as descendants of Alexander, Gray Eagle and Benedict Morrill, also appear in the first volume of the Morgan stud book. Neither was described as spotted, but the leopard pattern gene isn’t visible without the leopard complex (Lp) gene to activate it. Alexander would have had Pattern1, since he was a leopard, and he could have passed it along to his offspring. This is also true for any of his daughters that were used, but not recorded, in the backs of pedigrees, as well as any other leopard patterned horses found during that time. It is pretty clear that almost as soon as the stud book movement got off the ground, odd colors were systematically eliminated among finely bred horses. In the case of some of the appaloosa patterns, though, the component necessary for the louder parents could have remained among those horses that did not get Leopard Complex . Someday testing may allow breeders to check solid horses for the presence of these hidden genes. If pattern genes are found, they might just come from some of these “spotted Arabians”. I apologize that the blog has been so silent for the last few weeks. I have been consumed with work on the book for the last few weeks, and have been trying to focus on that. My planned publication date of late summer obviously passed, in part because I underestimated the technical issues I might encounter with the actual printing. That has been a big part of the problem, but I have to admit a lot of the delays are my own fault. If there is something that has characterized this project from the start, it has been mission creep. Believe it or not, this was supposed to be just a quickie reference guide for painters and scupltors; a handbook where they could quickly look up and see if this or that color or pattern was found in this or that breed. That grew when I decided to include as many of the lesser-known breeds as I could. Then I fell victim to my own interest in the history of breeds and their colors. Why just tell what colors breeds have, when you could also tell about what they used to have? But then I couldn’t really tell those stories without telling about how the breeds themselves were formed. Soon I was grappling with just how many volumes I would need for this, and the rest just followed. I also made this worse by not drawing the line on the inclusion of new material. Just when I would finalize the text, a contact for some obscure breed would surface, and I’d find myself adding back a breed that had been dropped because there was not enough information. Or a long-forgotten query would be answered, and I’d have to make room for more photos. Each addition seemed so unique, and so interesting, that it was worth the delay. Of course, I can hear those of you who know me well laughing now. It really took a peculiar blindness to my own bad habits not to see this coming. So now I have a book with 350+ pages and a word count somewhere around 170,000 (not including the front matter or the indexes, resource lists and extensive appendixes). I haven’t counted, but I believe there are close to 200 photos and illustrations. I have all that, but I am also months behind schedule. Right now the book is still being edited by outside sources, but I have high hopes to send out a printing proof before the holidays. I am sure that the book will not be ready before then, simply because everyone slows down (myself included) as the demands of the holiday season rise. I do apologize to everyone who has waited patiently, both for the book and for my return to a normal production schedule in the studio. My hope is that despite the delays, the resulting book will be a useful reference. I know I have learned so very much just in the writing of it!